A veteran NASA spacecraft orbiting Mars has gone into safe mode after a glitch was detected in one of its reaction wheels. The Mars Odyssey orbiter officially put itself into the protective standby mode early Friday (June 8), when the spacecraft detected unusual readings from one of its three reaction wheels, which are used to control the orbiter's orientation in space. "The spacecraft is safe, and information we've received from it indicates the problem is limited to a single reaction wheel," the orbiter's mission Manager Chris Potts of NASA's Jet Propulsion Laboratory in Pasadena, Calif., said in a statement. "The path forward is evaluating the health of the reaction wheel and our options for proceeding." The orbiter carries a spare reaction wheel onboard, in case one of the three in use fails. For now, the flight control team on the ground is in communication with the spacecraft while they decide what steps to take next and develop a recovery timeline. Mars Odyssey has been studying the Red Planet for over a decade. It launched in April 2001 and arrived at Mars six months later. It used a technique called aerobraking to slow itself down into the correct orbit by dipping down into Mars' atmosphere. The spacecraft began science operations in February 2002, and has now worked at Mars longer than any mission in history. It has created the first global maps of chemical and mineral distribution on the surface of Mars, and led to the discovery of vast amounts of water ice buried under the planet's surface. 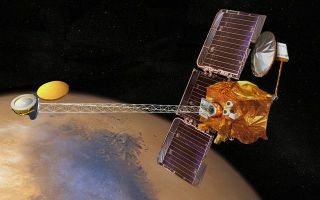 Mars Odyssey has also served as a communications relay station for landers NASA has sent down to the surface of Mars, and will relay messages from the next Mars rover, Curiosity, when it lands this August.